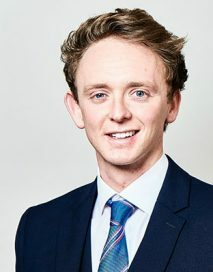 Nicholas joined Dere Street Barristers’ in 2013 and has gained a reputation for his charismatic style of advocacy and persistence in negotiation. He provides a high level of client and witness care and is known for his down to earth approach enabling him to quickly establish a good rapport with both lay and professional clients. Nicholas’ experience includes prosecuting and defending cases with a wide range of offences including domestic violence and robbery, public order, dishonesty and fraud, production and possession of drugs, burglary and road traffic offences. He conducts trials; appeals against conviction and sentence, Newton hearings and Proceeds of Crime proceedings. Nicholas regularly appears in the Crown Court, Magistrates Court and Youth Court on behalf of the Defence, the Crown, the Probation Service. Nicholas also regularly acts on behalf of Her Majesty’s Revenue and Customs (HMRC) and the Royal Society for the Prevention of Cruelty to Animals (RSPCA). Nicholas has also recently successfully prosecuted at the Royal Courts of Justice, and is confident in his ability to deliver a good result at all levels of the justice system. Nicholas appears regularly in the Family Proceedings Court (FPC) and County Court in both public and private law matters. Nicholas is regularly instructed to act on behalf of local authorities, family members, and children’s guardians in care proceedings; from urgent applications through to finding of fact hearings, final hearings, and appeals. He also represents applicants and respondents at all stages of financial remedy proceedings. Successfully prosecuted a six day trial at Newcastle Crown Court in which the Defendant was convicted of multiple opportunistic burglaries on vulnerable elderly victims using a similar modus operandi to previous offending. The case involved complex areas of law in relation to qualified identification procedures and bad character evidence. The Defendant was sentenced to 5 years custody. The Defence appealed the conviction which was subsequently refused by the Court of Appeal. Successfully prosecuted a brutal stabbing offence causing life changing injuries to the victim. The Defendant was convicted of a s.18 offence of wounding with intent and sentenced to 12.5 years custody. Prosecuted the first ‘killer clown’ jailed in the UK. The Defendant dressed as a ‘killer clown’ threatened a pregnant woman and proceeded to chase her down the street wielding an axe. Sentenced to 6 months custody. Prosecuted the owners of a care home who committed fraud in excess of £40,000 by stealing from vulnerable elderly residents over a 2 year period. Both Defendants received a 2-year custodial sentence and confiscation proceedings ensured all money was returned. Co-defended alongside John Elvidge QC in a case involving undercover officers posing as genuine sellers of illegal scrap metal to a scrap metal yard. The case was dismissed with large cost implications for the Crown after a successful abuse of process argument. Instructed for the Defendant, post-conviction, in relation to a highly lucrative confiscation order application under the Proceeds of Crime Act. Successfully defended a 4 day trial in which the Defendant was acquitted of Affray. Represented the Defendant who successfully put forward his defence of post driving alcohol consumption and was subsequently acquitted of drink driving. Ancillary Relief Proceedings for two Irish nationals who had settled in the UK. A consent order was made by Newcastle County Court with regards the sale of a property in the Republic of Ireland. The issue of jurisdiction was raised as to whether a British Court had this power. A successful legal argument was put forward addressing Brussels 1 1, Article 16 and this led to the successful conclusion of the case with the sale of the property and a lucrative financial settlement for the Applicant. Represented the Mother in successfully challenging an interim care plan recommendation which both the local authority and children’s guardian supported. Represented the Father during a four-day final hearing for care proceedings with a favourable outcome. Successfully represented the Applicant during private law proceedings and negotiated vastly improved contact arrangements with her two children.